All the credits in the galaxy won't guarantee you victory in your next space battle. They can, however, help you build a better fighter. 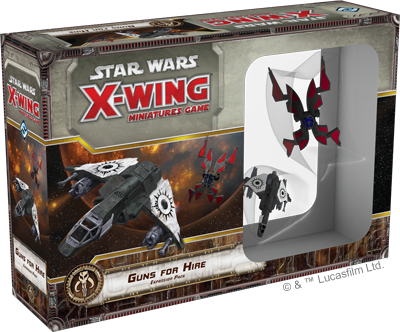 With its new ship cards, upgrades, and miniatures, the Guns for Hire Expansion Pack for X-Wing™ will soon offer a host of new tech and advantages to the pilots of the Scum faction's StarVipers and Kihraxz fighters. 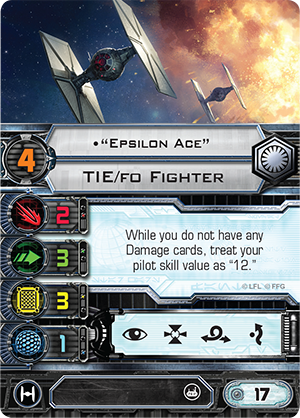 As we already saw in May's announcement of the pack, many of these new advantages result from the increased versatility afforded to the fighters by their new Title upgrades—the Vaksai and StarViper Mk. II . And while fans received both Titles with fantastic enthusiasm, much of the early conversation revolved around the Vaksai. 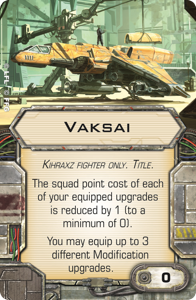 By allowing you to equip additional modifications and by reducing the cost of each upgrade you add to your Kihraxz fighter, the Vaksai opens an obvious measure of customization. 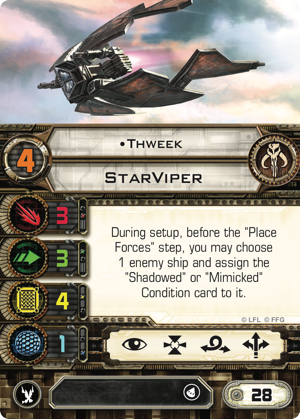 Today, though, we begin our previews with a closer look at the expansion's new StarViper, including its new StarViper Mk. 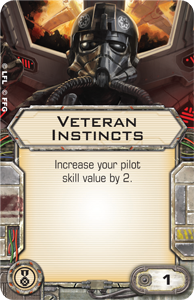 II Title, its new pilots, and some of the dirtiest, Scummiest tricks the expansion's other upgrades afford it. There is certainly an element to the StarViper Mk. II Title that's every bit as simple as what you find in the Vaksai. 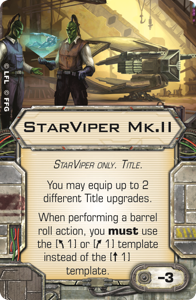 Applied to your StarViper, the Title reduces its squad point cost by three points and forces you to perform your barrel rolls with the Speed "1" bank template rather than the Speed "1" straight template. 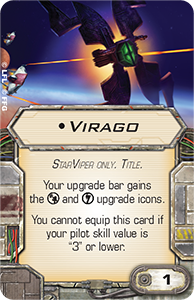 Additionally, it allows you to equip up to two different Title upgrades, meaning you can still field one of your StarVipers in battle as the Virago. On their face, these are all simple things. 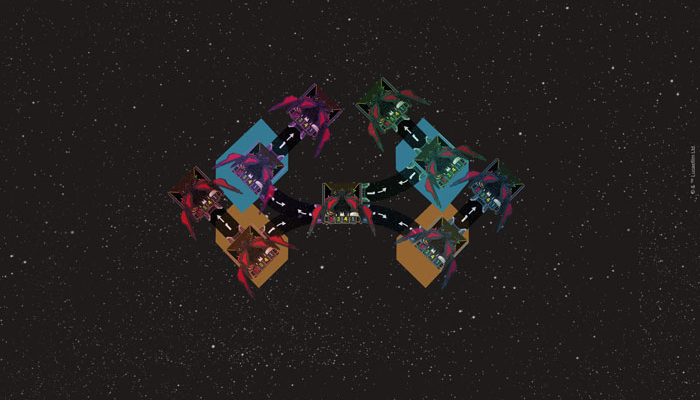 But once you begin exploring the ramifications of the new barrel roll, everything changes. 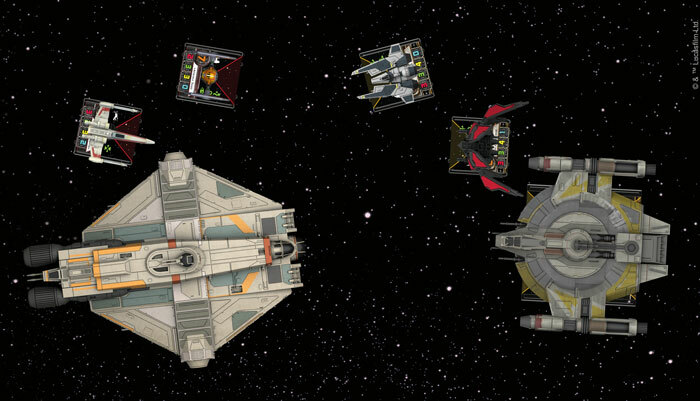 In X-Wing, ships feel different in battle and on the table because of their unique combinations of stat arrays, firing arcs, action bars, upgrade bars, base size, and maneuver dials. Of these things, the maneuver dial may be the hardest to grasp. After all, it takes a great deal of practice to learn how to judge your maneuvers accurately. But the maneuver dial may well be the single most defining part of a ship's identity. 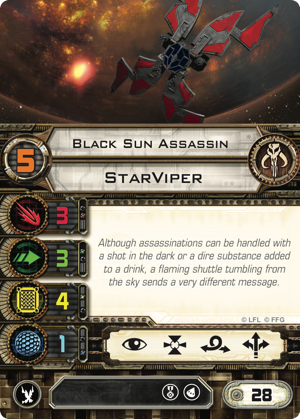 A 360-degree view of the StarViper from the Guns for Hire Expansion Pack. It is the TIE interceptor's wealth of green maneuvers at Speed "2," especially its green "2" turn, that make it feel like a nimble fighter at close quarters. Conversely, it is the Lambda-class shuttle's red "2" turn—and its red Speed "0" stall maneuver—that makes it feel like a large, lumbering target even while it boasts five hull and five shields. 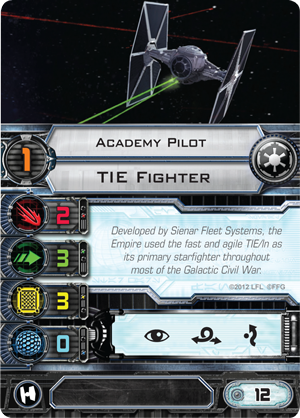 And the StarViper, with its wealth of close-range maneuvers, finds a place between the two ships because it lacks the interceptor's ability to transition to high-speed "3" turns and all of its turns are white. Although the StarViper's dial doesn't change with the StarViper Mk. 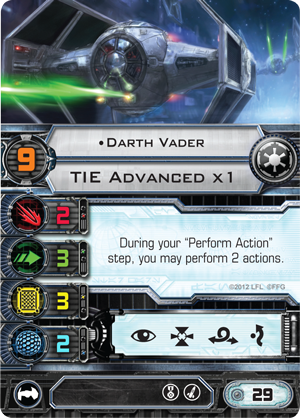 II Title, its ability to maneuver about the battlefield does. Accordingly, the dial starts to feel as though it's weighted differently, and the ship starts to feel different. For example, the Black Sun Assassin that would have needed to perform a Speed "2" right turn to catch his foe can now dial in a Speed "1" right bank and then adjust his firing arc a bit more with the barrel roll to not only catch his foe in arc, but at a closer range than he would have earlier. 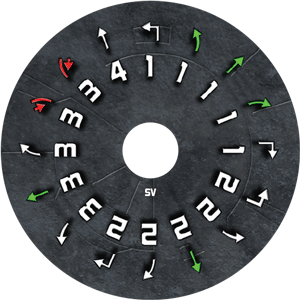 And because the "1" bank is a green maneuver, the Black Sun Assassin could plan to perform such maneuvers multiple turns in a row and still gain extra actions from Push the Limit . 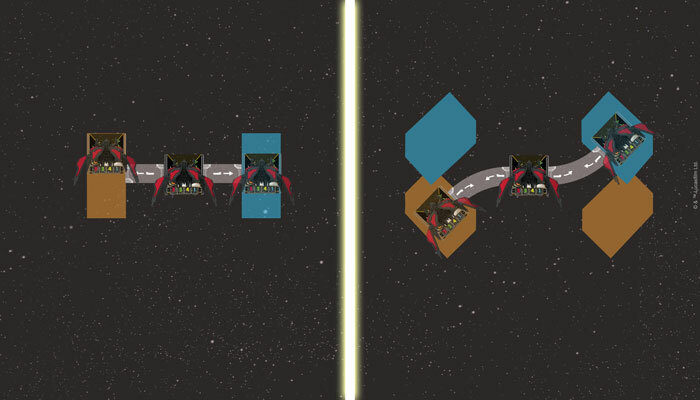 The impact of the new barrel roll template is further magnified when you apply the StarViper Mk. II Title to the same ship outfitted with the Virago Title and the Advanced Sensors system upgrade. 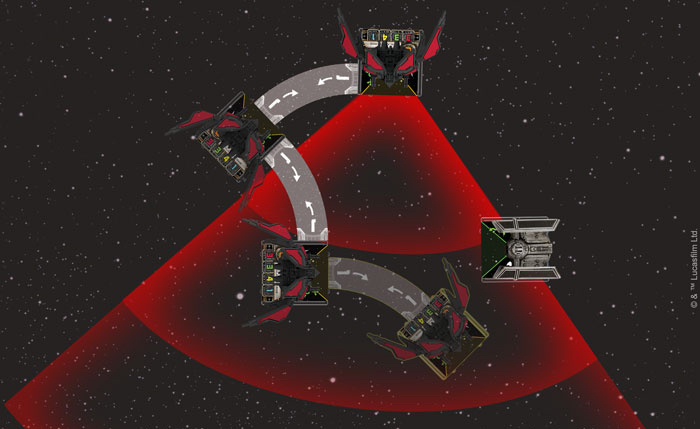 With Advanced Sensors, the StarViper Mk. II's new barrel roll allows you to face any of four different angles before you reveal your maneuver—none of which were previously possible—and all of these possible barrel rolls move you slightly further from your original position than a straight "1" template barrel roll would move you. The result is a highly variable range of movements that all use the same maneuver on the dial—a range of movement that may make it easier to prey upon your foes and to elude them. Accordingly, even without adjusting the StarViper's maneuver dial, the StarViper Mk. II Title makes the fighter a far more slippery ship, but one that's certain to demand—and reward—an active imagination, as well as your patience with its steeper learning curve. The StarViper Mk. II with Advanced Sensors—when a straight "1" isn't just a straight "1." 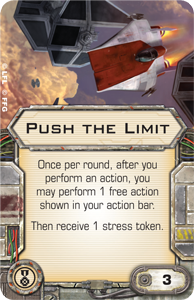 The new StarViper miniature from Guns for Hire gains even more versatility from the new pilot abilities introduced by Dalan Oberos and Thweek . 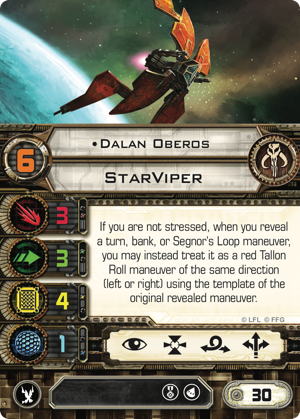 The higher pilot skill of the two unique StarViper pilots, Dalan Oberos is all about positioning. This human bounty hunter first appears in the Force and Destiny™ adventure, Chronicles of the Gatekeeper, where it's made clear he's willing to take gigs from the Empire and cartels alike. Rumors even suggest he has recently taken a job looking for suspicious characters around Cato Neimoidia. 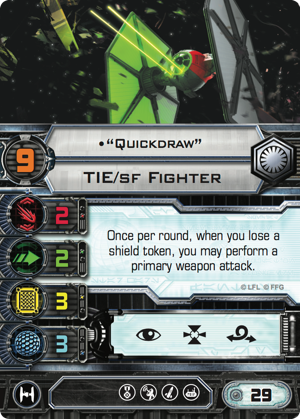 His ability to pursue his quarry is reflected in X-Wing with his unique pilot ability to treat any turn, bank, or Segnor’s Loop maneuver that he reveals as a red Tallon Roll maneuver with the same template. If he's also equipped with the StarViper Mk. II and Virago Titles, plus the Advanced Sensors upgrade, he gains an almost unparalleled ability to adjust to the final position of any foe on the battlefield. 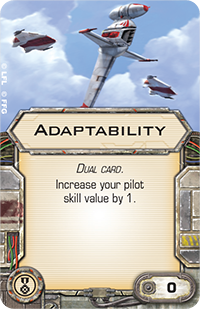 This means you're likely to see him equipped with the Veteran Instincts or Adaptability elite pilot talents to boost his pilot skill value of "6" to a level at which he's more likely to be able to react to his opponent's maneuvers. When Dalan Oberos realizes his speed "1" right bank maneuver would put him in a bad position, he can barrel roll and Tallon Roll to turn the tables on his foe. 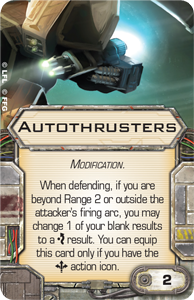 On the other hand, if you're looking to see what your StarViper Mk. II can bring to battle apart from its maneuverability, you might consider recruiting Thweek as your pilot. This Kubaz spy first appeared in the Edge of the Empire™ adventure, The Long Arm of the Hutt, as a greedy, underhanded, and ruthless associate of Teemo the Hutt. 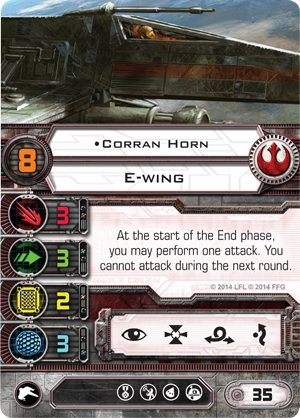 In X-Wing, you'll find him every bit as shifty as he was in Edge of the Empire, even though he lacks an elite pilot talent slot. This is largely because he allows you to assign one of two conditions to an enemy ship during setup, and the way Thweek flies is bound to hinge upon the condition you choose to assign and the ship to which you assign it. If you choose Shadowed , you can copy the starting pilot skill value of any of your opponent's ships. 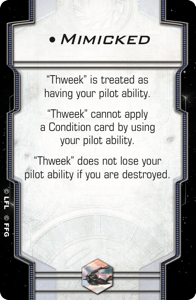 For the remainder of the game, then, Thweek could fly like a blocker at an Academy Pilot's pilot skill value of "1." Or he could poach the pilot skill value of "12" from your opponent's "Epsilon Ace" and stay at pilot skill "12" even after "Epsilon Ace" takes damage and drops back to pilot skill "4." And while Shadowed provides Thweek a great deal of flexibility against lists that aren't heavily focused on unique pilot abilities, it pales in comparison to what the Mimicked condition allows Thweek to bring to your squad. 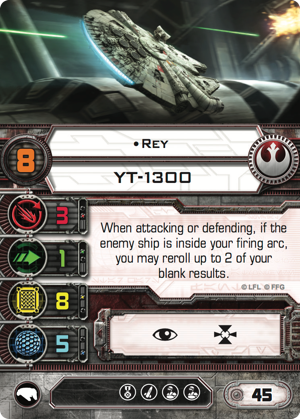 With Mimicked, Thweek can copy the unique pilot ability of any of your opponent's ships, and the possibilities are a bit staggering—even if they're wholly unpredictable. 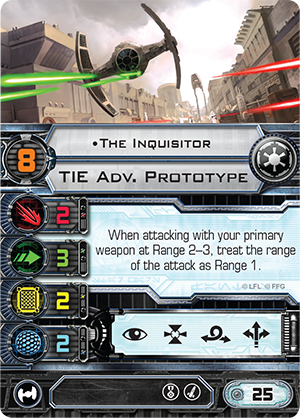 Against the Rebels, Thweek could serve the same role as Biggs Darklighter , but with a higher agility and the ability to equip Autothrusters . 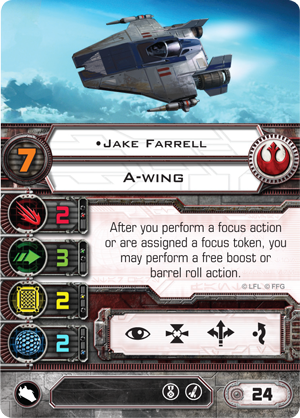 He could double-attack like Corran Horn , gain rerolls like Rey , or dart about the battlefield with boosts and barrel rolls like Jake Farrell . 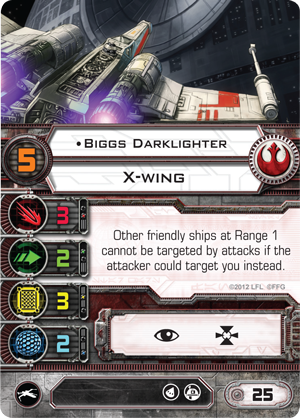 Against a Rebel list with Biggs Darklighter, Thweek can force your opponent to take shots at him instead of the rest of your squadron. 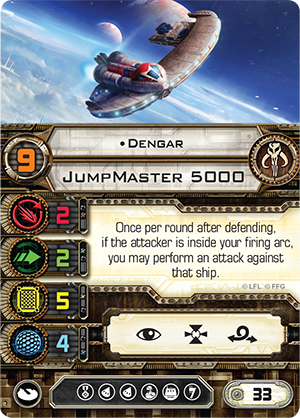 Against other Scum players, Thweek could poach tokens like Genesis Red , launch fearsome Range "1" attacks like Fenn Rau , or fire retaliatory attacks like Dengar . 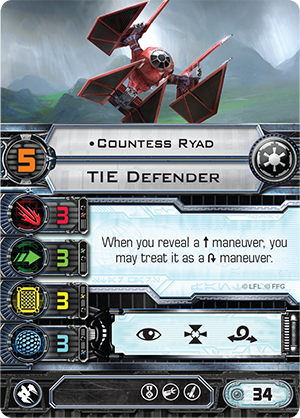 And against Imperial players, you might copy Darth Vader's ability, or that of The Inquisitor or Countess Ryad . You could even assign Mimicked to "Countdown" to place a hard cap on the amount of damage you can take, and then you could recover that damage with a Pulsed Ray Shield . 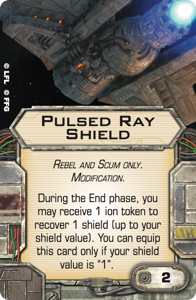 Finally, it's worth noting that while triggering Pulsed Ray Shield should normally make the devious Kubaz a great deal more predictable than he would like, Guns for Hire ensures that anyone flying the Virago is going to get his or her credits' worth. 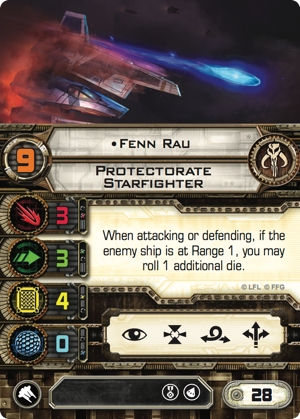 Because the Virago gives your StarViper an illicit slot, you can then pair your Pulsed Ray Shield with a set of Ion Dischargers to assign the ion token to your Range "1" opponent instead of yourself. 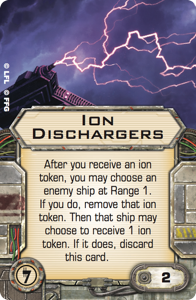 And this forces your opponent to make a difficult choice—discard the ion token and allow you to keep your Ion Dischargers, or discard your Ion Dischargers, retaining the ion token and leaving a ship to limp through space. 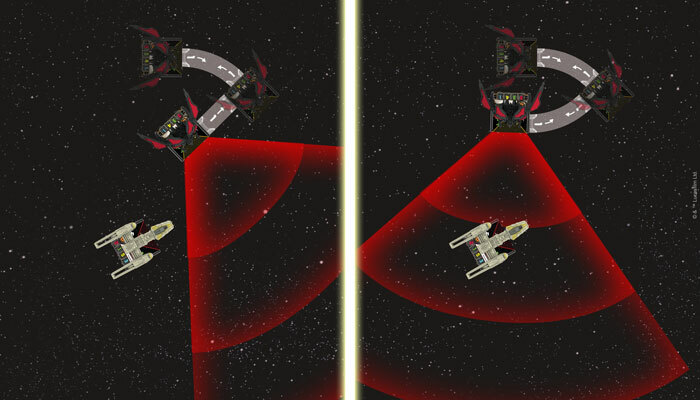 There are many ways you can approach your X-Wing battles. You can take advantage of the numerical superiority of a swarm. You can intimidate your foes with powerful missiles and torpedoes and the retaliatory strikes enabled by pilots like Dengar and "Quickdraw." You can litter the battlefield with bombs. 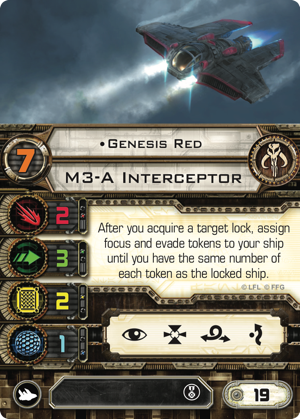 Or you can setup your squad with one or more copies of the red and grey StarViper from Guns for Hire. 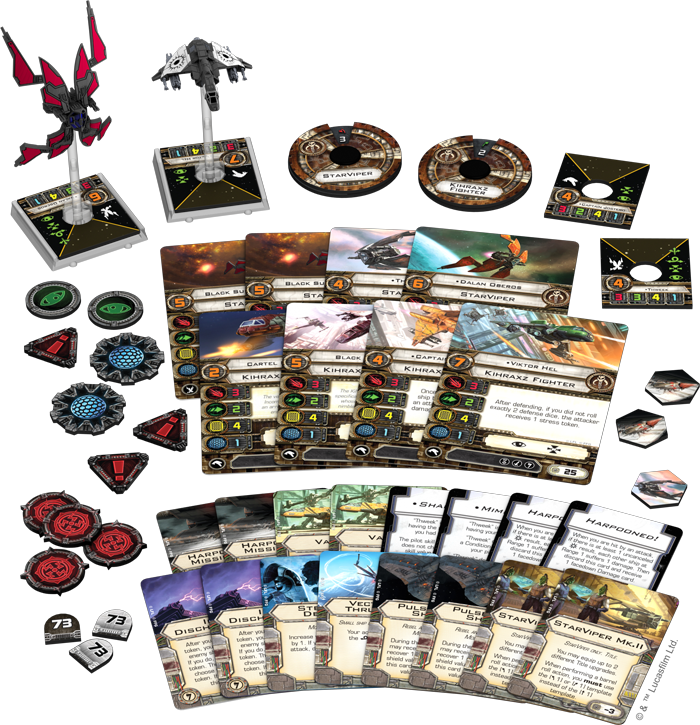 Placing this new StarViper on the table sends a message. 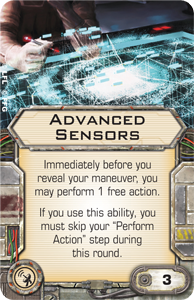 It says you're going to fight dirty, utilizing slippery maneuvers and illicit technologies to hit your opponents when their eyes are turned elsewhere. It says your opponent's going to have trouble predicting your next maneuver, and that you're less likely to be caught by your opponent's best tricks than to turn the tables. What message will you send with your new StarViper? Share your thoughts with our community forums. Then head to your local retailer to pre-order your copy of the Guns for Hire Expansion Pack (SWX73)!